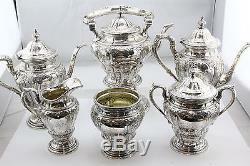 Antique Black Starr & Frost Sterling Silver Complete 6 Piece Repouse Tea Set. The set is in great estate condition and ready to use. All the pieces have their original 3 letter fancy monogram on them. I cannot quite make it out. 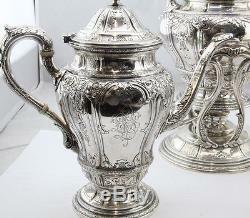 The handle on the hot water kettle / samovar is broken at the insulators. Somebody used pins to hold it together so it still works but the insulators should be replaced. All of the pieces are hallmarked "Black, Starr & Frost Sterling 857/90" and the burner on the hot water kettle is just marked Sterling. 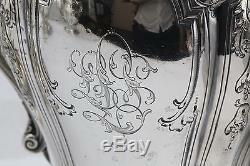 The Black, Starr & Frost mark is punched over top of a Dominick & Haff makers mark and I believe the pattern is Marie Antoinette. 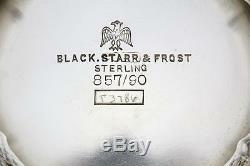 Black Starr & Frost were the retailers of this fine set but it was produced by Dominck & Haff. 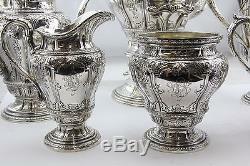 When we got the set it came with a sterling silver tray that we are listing separ ately. It was made for Black Star & Frost in England and is not quite the same pattern so it may have been married to the set later. The 6 piece set consists of the following pieces. 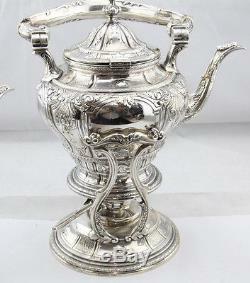 1 Hot water kettle / Samovar with stand and original solid sterling silver burner. It stands about 12 with the handle down. 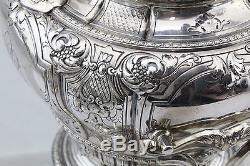 Kettle is also marked 3 1/2 Pts on bottom. 1 Coffee Pot that stands about 11 Tall. Also marked 2 3/4 Pts. 1 Tea Pot that stands about 10.25 tall. 2 1/2 Pts on bottom. 1 Open Creamer that stands about 6.75 tall. 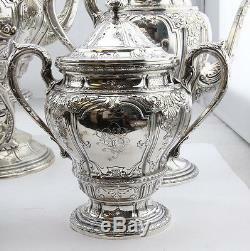 1 Covered Sugar Bowl that stands about 8 tall with lid. 1 Open Waster Bowl that stands about 5.5 Tall. 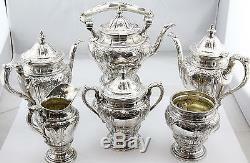 The entire set of 6 pieces weighs a total of 162.5475 Troy Oz. 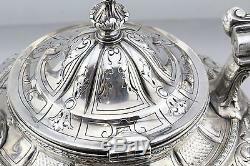 The item "Antique Black Starr & Frost Sterling Silver Complete 6 Piece Repouse Tea Set" is in sale since Tuesday, November 10, 2015. The seller is "gatsbysjewelry" and is located in New Jersey. This item can be shipped to United States.